Micronutrients deficiency are often common in elderly people due to a number of factors like reduced food intake and lack of variety in foods they eat. To study the food habits, food pattern, dietary intake and their effect upon nutritional profile of elderly males belonging to rural and urban area. This was a cross sectional study done among 100 elderly males, 50 each belonging to HIG and LIG in various villages of district Ludhiana in the age group of 60 and above. A pretested, semi- structured questionnaire was used to collect the data. The data was analyzed by using different statistics formulas. The result shows that the average daily intake of energy by the elderly male respondents of HIG ranged from 1565 kcal to 1818 kcal and for respondents of LIG ranged from 1432 kcal to1660 kcal which was below the energy requirements given for 60+ age group based on their body weights. Significant association was found between knowledge and occupation, education, marital status and income. This study shows that the diet of the respondents of HIG were adequate in protein, fat, calcium, iron, vitamin C but were inadequate in energy, carbohydrates, fibre, carotene and riboflavin. The diets of elderly of LIG respondents were inadequate in all the major nutrients leading to nutritional deficiencies and making them more susceptible to diseases. 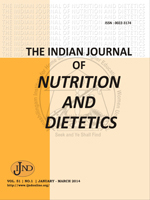 Nutrients, Food Intake, Elderly Males, LIG, HIG, ICMR.